I am pleased to announce that the latest NIF issue guide, Coming to America: Who Should We Welcome, What Should We Do?, is released today. At the NIFI link, there is also available an “issue advisory” for free download – such advisories are the core “name” and “frame” of the issue in an easy to use format, and are suitable to use in a deliberative forum setting on their own. The immigration issue affects virtually every American, directly or indirectly, often in deeply personal ways. The issue guide is designed for people to use to deliberate together about how we should approach the issue as a society. It presents three options that reflect different ways of understanding what is at stake and that force us to think about what matters most when we face difficult problems that involve all of us — and that do not have perfect solutions. This option says that immigration has helped make America what it is today — a dynamic and diverse culture, an engine of the global economy, and a beacon of freedom around the world. This option says we need a fair system, where the rules are clear and, above all, enforced. With an estimated 11 million people living in the country illegally, our current system is unjust and uncontrolled. This option recognizes that newcomers have strengthened American culture in the past. But the current levels of immigration are so high, and the country is now so diverse, that we must regain our sense of national purpose and identity. The Kettering Foundation researches and develops issue guides like this one and makes them available to NIFI to publish. Follow the link for more information and to order or download your own. 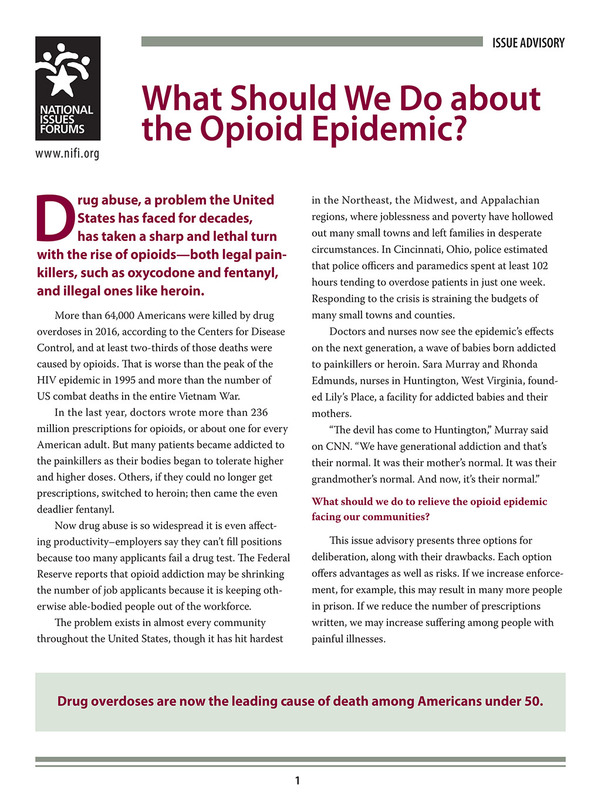 I am pleased to announce a new “issue advisory” that is available as a free download (or fold-out hard copy) from the National Issues Forums Institute titled What Should We Do About the Opioid Epidemic? I am proud of my role in helping develop this resource. The Kettering Foundation researches and develops issue frameworks like this one and makes them available to NIFI to publish. My friend and longtime colleague Tony Wharton wrote the text. Drafts of this advisory have been tested all throughout the U.S. and it has proven to spark a useful conversation. The issue advisory is meant to support broad-based community conversation about what we, in our communities, should do in response to the drastically rising epidemic of opioid use, abuse, and deaths. Follow the link to order or download your own. Friends know that at the Kettering Foundation we recently started a new blog called Inside Public Judgment, devoted to sharing what we are learning about framing issues for public deliberation — a behind-the-scenes look at various aspects of developing issue guides. My latest piece is posted, which outlines some of the false starts we made as we began development of a recent popular issue guide called Political Fix: How do we get American Politics Back on Track? This guide went through a longer evolution than most, as we at Kettering tried to make sure we fulfilled one of the key things we have learned about framing issues for public deliberation: it is critical to start where the public starts. People said they see the issue of “money in politics” as much broader than simply questions about campaign finance—they believe that limiting the conversation in this way leaves too much untouched. They are sophisticated enough to believe that money plays a part throughout the current political system. Just as important, people said that there are more fundamental problems in our political system than just money and power. They were interested in a conversation that goes beyond money and addresses more basic questions. It was clear, in looking at these results, that an issue guide about the broader problem of American politics in general—and what to do to fix its current ills—could be widely useful to citizens. Read the full post here, which describes more about the framework we ultimately developed. 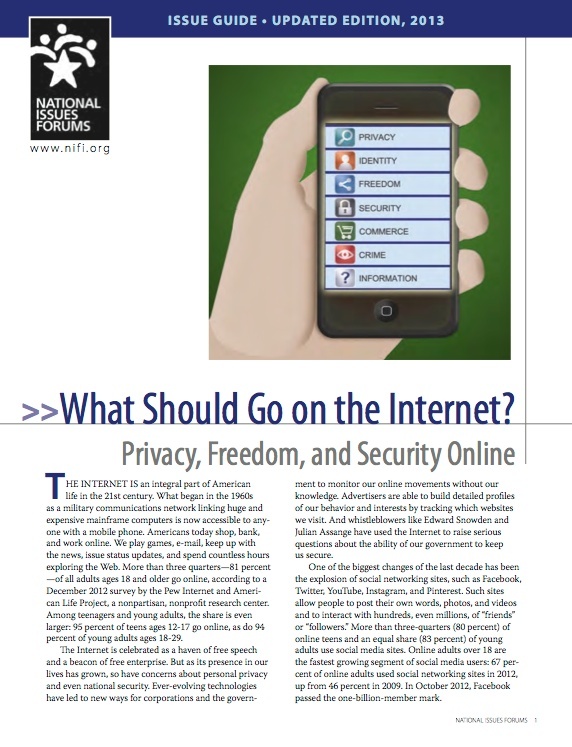 Posted on August 27, 2013 Categories internet, issue guides, ketteringLeave a comment on New Issue Guide From National Issues Forums: What Should Go On The Internet?